Four years ago when we first traveled to Porto, the city was clearly struggling, as was the restaurant scene. I chose not to blog about my trip, in part because Richard’s bout with food poisoning slowed us down, and in part because I found the boarded-up and mostly deserted downtown, in the midst of the economic crisis, too depressing. My mother’s family once owned a department store that shuttered when chain stores, and especially Wal-Mart, spread throughout the South in the 1980s, and I saw the same thing happening to Porto’s once majestic Art Deco department store downtown. 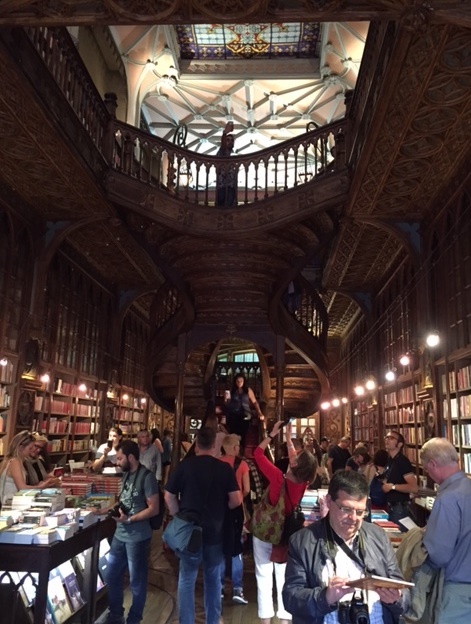 A crowded Livraria Lello, inspiration for Hogwarts in the Harry Potter series. Four years later, the department store is still there, with its ground-floor name-brand shops crowded with tourists and locals. Next door, Livraria Lello sells admission tickets for three euros apiece, which can be used as a credit for books bought in the store. And why does a bookstore sell admission tickets? This was the bookstore J.K. Rowling visited when she lived and taught English in Porto, and apparently she used its staircase as inspiration for the staircases in Hogwarts. With the influx of tourists to Porto over the past three years, Harry Potter fans added the store to their itineraries and too many crowded inside to take pictures without buying books. I did buy a book, and I took many pictures as well. Richard checks out the menu at Cantina 32 in Porto. We’ve returned to Porto for the past three years, and every year, more blocks have been turned into housing, hotels, shops, and restaurants. The sad restaurant scene of yore is gone, as is that terrible restaurant that sickened Richard, pushed out by stiff competition and both tourists’ and locals’ changing tastes. Traditional Portuguese food has morphed into hybrids with other cuisines — notably Asian, Italian, and Latin American. There are also a number of organic, vegetarian, and vegan eateries that take advantage of widely available fresh produce. 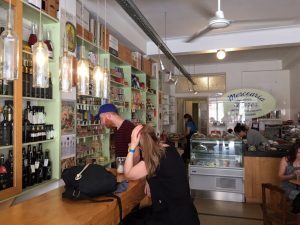 For the first time, Richard has found a critical mass of restaurants, enough for a review column of Porto restaurants as well as our go-to place in Coimbra, inside the hotel where we’ve stayed for the past two years. 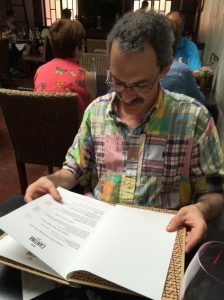 This year, we also had the privilege of taste-testing the restaurants with Sandra Nickel, my VCFA classmate and friend who lives outside Geneva and who met us in Porto and traveled with us to Coimbra this year. Cantinho do Avillez (Rua Mouzinha da Silveira, 166; phone: 351-223-227-879). Chef José Avillez has expanded his small, and uniformly excellent, restaurant empire to Porto. 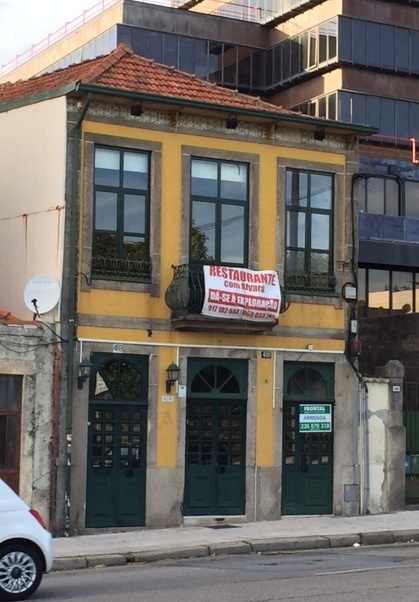 This restaurant shares some of the dishes from the Cantinho do Avillez in Lisbon, but has other dishes that are special to Porto. The Porto dishes draw on influences from the Middle East and South Asia. Their vegetarian tagine is wonderful, as are the giant shrimp with Thai spices. Their two veal dishes, veal risotto and veal cheeks with curry, are outstanding. Restaurante DOP (Largo Santo Domingos 18; phone: 222-014-3130. This modern restaurant is in the beautiful 19th century Palácio das Artes. Like the setting, the menu offers modern interpretations of classical Portuguese dishes along with items inspired by restaurants elsewhere in Europe. The service is friendly and helpful. We were most impressed by an appetizer of crab raviolis in a pea sauce and a slow-cooked egg with oatmeal and sausage. The main dishes were less memorable. A tasty lobster rice was paired with overcooked sea bass, and octopus was bland. The desserts were unusual and tasty, especially the curry ice cream that transformed a typical molten chocolate cake. There are both tasting menus and a la carte choices. The interior of Mercearia das Flores, where Sandra found many gifts to bring back to her husband and friends. Mercearia das Flores (Rua das Flores, 110; phone 222-083-232). A great spot for lunch or a snack. Their sandwiches are very tasty and somewhat inventive. They also offer meat and cheese plates, salads and desserts. 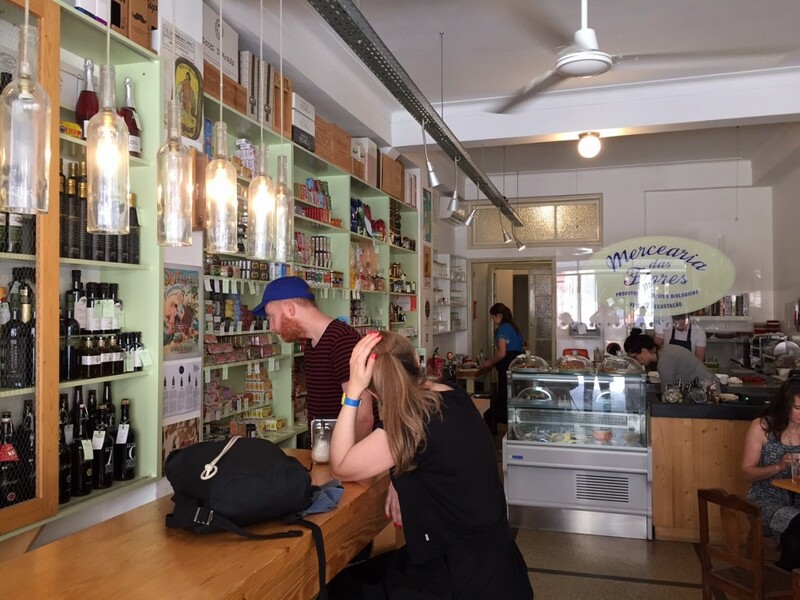 The tables are inside a food shop with an excellent selection of canned Portuguese fish, wines and liquors, and cheese. Cantina 32 (Rua das Flores 32; phone: 222-039-069). A fun, lively spot for lunch or dinner, with a friendly attentive staff. Their small dishes are delightful, especially their squid appetizer. We performed a menu hack by spooning the delicious sauce from the squid on top of an otherwise bland couscous salad, creating one of the best dishes we had in Porto. Their main dishes offer large slabs of meat or fish with sauces that while not memorable do well at bringing out the flavor of the proteins. The culprit, near the University of Porto. Food poisoning shouldn’t be an occupational hazard of restaurant reviewers. Arcadas (in Hotel Quinta das Lagrimas (Rua António Augusto Gonçalves, 3041-901; phone 239-802-380). This is the most sophisticated and elegant restaurant in Coimbra, located in the nicest hotel in town which is set in a beautiful garden and is a 10 minute walk from the old town (and another 10-15 minutes climb up to the university). 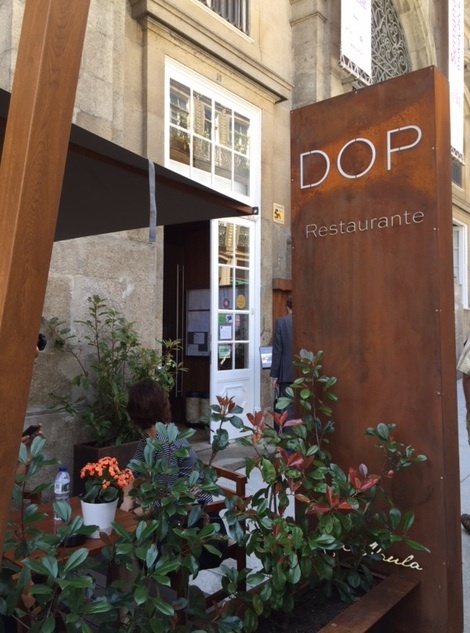 The food is not inventive and instead tries and usually succeeds in following the path blazed by top chefs in Lisbon who bring modern techniques and high quality ingredients to traditional Portuguese dishes. There are both tasting menus and a la carte choices. 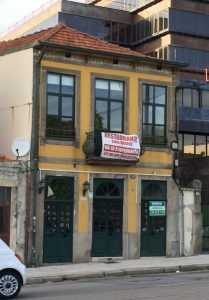 Finally, the pastry and sandwich chain Nata, first featured as a neighborhood place when we lived near Principe Real in Lisbon in 2012, expanded to other cities including Porto and Coimbra between 2013 and 2015. Since then, Nata has expanded to other countries in Europe and the Middle East, places where Portuguese have recently moved for economic reasons but a good way of spreading the word about this centuries-old culinary invention of the monks at the Jerónimos Monastery in Belém, just outside Lisbon. Thank you, Lyn. Thank you, Richard. What a perfect review of Porto and Coimbra and the restaurants we sampled. As I read, all the taste-memories came flooding back. Thank you for including me in your Porto adventures. I loved every minute of it.